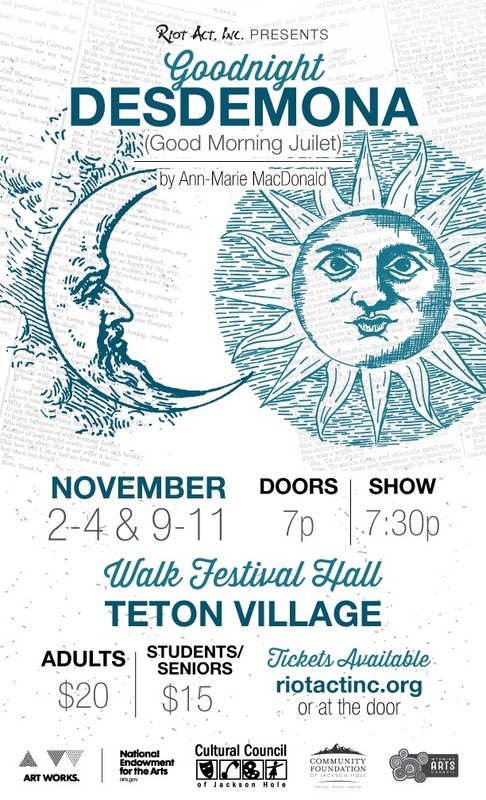 Goodnight Desdemona (Good Morning Juliet) by Ann-Marie MacDonald – Riot Act, Inc.
Riot Act Inc.’s first production of our 15th season, Goodnight Desdemona (Good Morning Juliet) by Ann-Marie MacDonald, runs Nov. 2-4 and 9-11 at Walk Festival Hall in Teton Village. 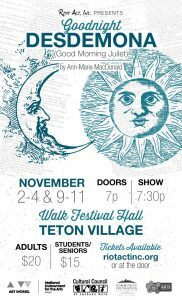 Helmed by veteran director Macey Mott, Goodnight Desdemona boasts a wonderful cast including Michael Yin, Christopher Eichelberger, Laruen Dierkes, Angel Dillon, Kelsey Johnson, Frankie McCarthy, Prince, Jessica Schiers, and Henry Raynor Williams. Tickets are available in advance online at www.riotactinc.org or at the door and cost $20 for adults or $15 for students/seniors.. Brand new, re-designed Riot Act, Inc. T-shirts and Concessions will be available at the concession stand before each performance and during intermission.